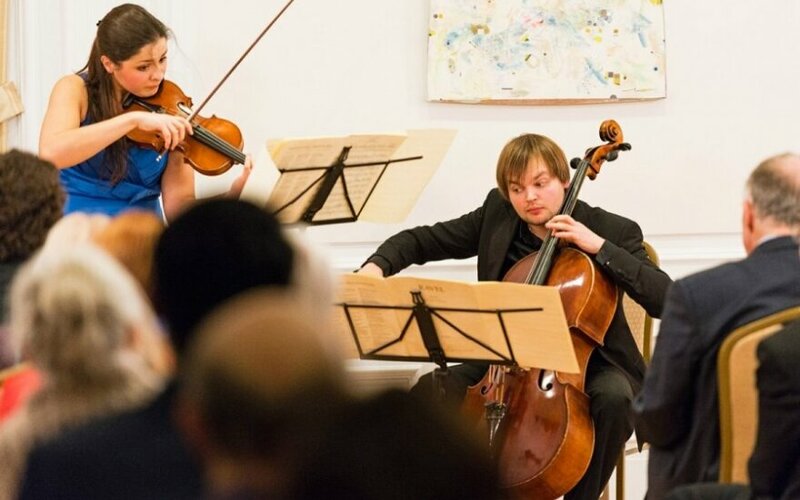 On 15 January, the duo of Dalia Dedinskaitė and Gleb Pyšniak played a recital in remembrance of Lithuania’s Freedom Defenders’ Day at the Lithuanian Embassy in Washington. The duo performed works by Zoltán Kodály, Vytautas Barkauskas, and Maurice Ravel. Mindaugas Žičkus, Deputy Chief of Mission at the Lithuanian Embassy in Washington, DC, welcomed the audience and reminded them about the tragic events in Vilnius on 13 January 1991. He then introduced Dalia Dedinskaitė, violin, and Gleb Pyšniak, cello. The Duo started with a classical arrangement of a Lithuanian folksong as a tribute to the 14 people killed on that January day in 1991. The two musicians then played the duo for violin and violoncello Op. 7 by the 20th century Hungarian composer Zoltán Kodály. The duo had received the "Kodaly Award" at the ISA festival in 2012 for their performance this rarely heard work. The melodies and rhythms of this composition show how Kodály had assimilated folk styles into his own individual voice and style. The performance demonstrated the vast talent of the two young musicians. The duo then performed the Duettissimo, Op. 137 by the Lithuanian composer Vytautas Barkauskas. Gleb Pyšniak told the audience that the composer had written this work specifically for the duo and that this was a premiere for the USA. Barkauskas is considered one of the greatest living composers of the Baltics and this chamber work makes one wonder why we do not hear more of Barkauskas’ music. The Duettissimo allowed the two accomplished musicians to show their remarkable ability and interaction. Dedinskaitė and Pyšniak ended the concert with the Sonata for violin and violoncello by French composer Maurice Ravel. Ravel completed his Sonata in 1922. Gleb Pyšniak told the audience that Ravel had dedicated this work to Debussy as it evoked "various landscapes and sceneries that inspired Debussy as well as landscapes painted by Monet.” The work has some pleasant features. The thinner texture used in this work by Ravel shows a style that was popular with composers in the period following the Great War. As an encore, the duo performed the Norwegian composer Johan Halvorsen’s Passacaglia in G minor on a theme by George Frederic Handel. This work was originally composed in 1897 for violin and viola and was here adapted for violin and cello. About the less conventional duo set-up, Gleb Pyšniak said after the concert, "a duo with violin and cello is probably one of the most intimate settings in chamber music." The concert certainly made that point clear to an enthusiastic audience. Together the duo of Dalia Dedinskaitė, violin and Gleb Pyšniak, cello has performed in such prestigious venues as the Amsterdam Concertgebouw, the Musikverein in Vienna, the Paul Hall of The Julliard School in New York, the Casa da Musica in Porto, Portugal and the Great Hall of Moscow Conservatory. Dalia Dedinskaitė was born in Vilnius, Lithuania, and is currently is studying Violin and Chamber Music in Vienna, where she studies at the University of Music and Performing arts. Ms. Dedinskaitė is a graduate of the Lithuanian Academy of Music and Theatre. She won the International violin competition “Violine in Dresden 2010″ in Germany and as a young artist was invited to perform the Ludwig van Beethoven violin concerto during the Dresdner Festspiele in 2012. Ms. Dedinskaitė has performed at various concerts in the USA, Germany, Austria, the Netherlands, Lithuania, and France. Gleb Pyšniak is currently also residing and studying at the University of Music and Performing Arts in Vienna. Born in 1987 in Vilnius he graduated from the Lithuanian Academy of Music and Theatre.